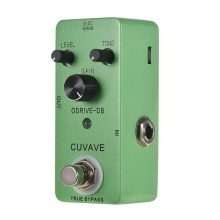 Analog overdrive pedal with sound effect that very close to Dumble electrical tube AMP. 3 control knobs: LEVEL–adjusts the volume, GAIN–adjust the gain output, TONE–adjust the brightness of the overdrive sound. True bypass footswitch for switching between overdrive effect and bypass status. With LED light for indicating effects or bypass status. Zinc Alloy shell and compact size, durable and portable. Please use the power adapter whose polarity is positive pole outside and negative pole inside. Otherwise, the product may not work properly.